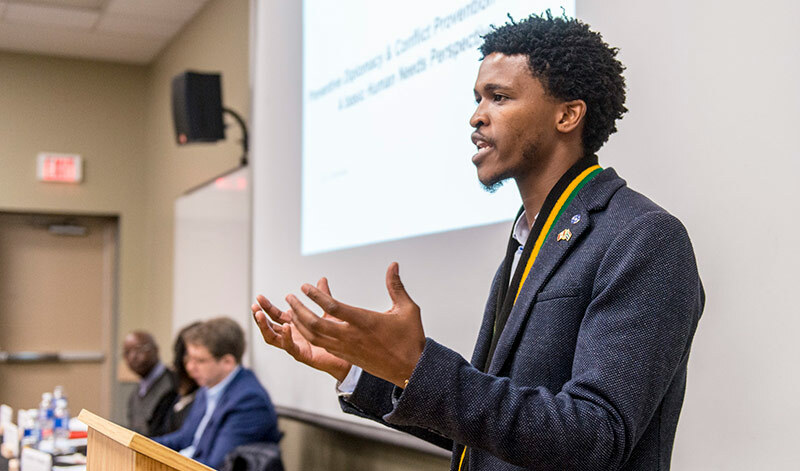 The University of New Brunswick held community conversations focusing on peace, social justice, conflict resolution and reconciliation with Siyabulela Mandela on April 1 and 2. Mr. Mandela, grandson of Nelson Mandela, carries on his grandfather’s legacy as a renowned activist and freedom fighter. He is currently a lecturer and a PhD candidate in international relations and conflict resolution in the department of politics and conflict studies at Nelson Mandela University in South Africa. UNB Saint John hosted a panel discussion on April 1. Dr. Obed Nkunzimana, professor of humanities and languages, Dr. Robert Whitney, history and politics professor and Dr. Mercy Oyet, assistant professor in the faculty of business, joined Mr. Mandela to discuss his research and PhD dissertation Preventive Diplomacy and Conflict Prevention in Africa: Examining South Africa's Role in Conflict Resolution in the Democratic Republic of Congo. UNB Fredericton held a community conversation on April 2 with Mr. Mandela and Piluwitahasuwin Amanda Reid Rogers, focusing on the importance of social justice and reconciliation not only in our province, but also around the world. Among the capacity crowd were students, staff, faculty and leadership from the Indigenous community. Through the ongoing efforts in education and outreach of the Mi’kmaq-Wolastoqey Centre, the UNB community has a greater understanding of our shared past. Dr. George MacLean, vice-president (academic) Fredericton, encouraged the audience to embrace the culture that surrounds UNB on a daily basis. “By continuing to support our local efforts, we can create a community where everyone feels welcome as equal members of our society,” says Dr. MacLean.